Honor 7X is another recent smartphone by Huawei which is a great value for money. The built quality of this device is super solid and so is the display. It&apos;s display is bright and vivid giving a immersive experience. Talking about the UI, I like it very much and it&apos;s full of rich features. Cameras are great but it can be much better and the same applies to the battery. Performance of phone is very good. Everything is good in phone for its price. I bought this in exchange for Redmi note 3. I personally liked this phone over Redmi note 3 where software is really a headache. But Honor phone is like using a Samsung phone. Easy and nothing complicated. Camera results & features are good so is the battery life. Touch is very feathery. Fast & Accurate Fingerprint sensor. Camera Is awesome as compared to other this price range smartphones. Sometimes phone restarts when watching videos on YouTube. Screen is great at this price point. Performance is also awesome for something this cheap. Camera is good in natural and well lit conditions. Call voice is good. Loud enough for noisy environment. Speaker is moderate, loudness is average. Headphone sound is Okay for the price. Built and construction of this device is almost equal to premium handsets but processor performance is above average and more importantly camera quality is highly mediocre which is the only drawback of this handset but for the selling price it is a steal. Overall, a good phone but camera needs improvement. Long lasting battery of 3340mah. Better UI when compared to other smartphones in similar range. No heating issues at all. Bright 5.93 inch HD display with vibrant colors. 12 Pricebaba users have written their experience with Honor 7X. If you own Honor 7X, please do leave your feedback too. 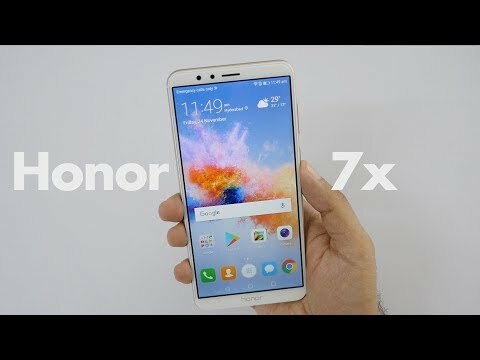 Lowest price of Honor 7X price in India starts at Rs. 12,000 Honor 7X is available on Flipkart at Rs. 12,000. Prices updated on 21st April 2019. Huawei has launched a mid-budget smartphone, the Honor 7X in the Indian market. The device joins the list of bezel-less smartphone trend along with a dual rear camera setup. Let’s see what this phone offers out of the box. The Honor 7X features a 5.9-inch Full HD display with a resolution of 2160 x 1080 pixels & 18:9 aspect ratio screen. The screen is protected by a Corning Gorilla Glass. It has a pixel density of 407 PPI. The device sports a metal unibody that ensures durability. It has rounded corners & there are minimum bezels. The fingerprint scanner is located on the back of the device. On the bottom there is a 3.5 mm headphone jack. Sensors on the phone include accelerometer, proximity sensor and magnetometer. The device ships in three attractive colors i.e. Black, Blue and Gold. In the photography department, the Honor 7X is equipped with a dual rear camera system comprising of 16MP + 2MP sensor. It is accompanied by LED flash for low light photography. There is a PDAF system that aids quick focusing. The camera software has various features like moving picture mode, wide aperture, portrait mode, face detection, HDR & panorama. On the front, there is a 8MP sensor for clicking selfies & video calling utilities. The rear camera allows the user to record Full HD videos (1080p). On the hardware front, the Honor 7X houses a 2.36GHz HiSilicon Kirin 659 octa-core processor. It is paired with 4GB RAM along with graphics processor onboard. It offers 32GB internal storage which can be expanded up to 256GB via microSD card. The device runs on Android 7.0 Nougat based EMUI 5.1. The Honor 7X is powered by a non-removable 3340 mAh battery. It is a dual sim smartphone & nano sim cards are compatible with this device. Connectivity options on this phone include GPS, FM Radio, 4G LTE, 3G, 2G, WiFi, Bluetooth & VoLTE. Ans: Yes, the Honor 7X offers VoLTE connectivity out of the box and thus you can use Reliance Jio. 2. How is the camera for selfies? Ans: You can expect good quality selfies with an 8MP front snapper. 3.Does the phone have a Hybrid SIM slot? Ans: Yes, a Hybrid slot lets you insert two sim cards or else one sim + a microSD card. Ans: No, the device doesn’t let the user to remove its battery. 5. What comes in the box? Ans: Inside the box, you will get the device with accessories like charger & separate cable, earphone, SIM ejector tool & a user manual.